The image has been removed for viewing by the website until the issue is resolved. Meantime I really don't know how many of the cd's were sold or distributed. 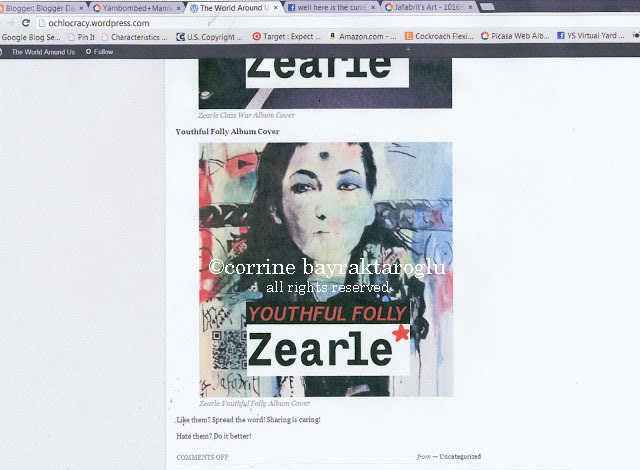 I was doing a search today and discovered Zearl Youthful Folly used my painting of my daughter for their album cover. Anybody recognize this painting, YES, it's mine, and so is the photograph of it. The reason it is blurry is because the original posted image on my blog entry about it was small dpi. It is a painting that I did for peeps in the park. Astonishing that YET again I find a painting of mine ripped off and used without permission, no compensation, NOTHING. 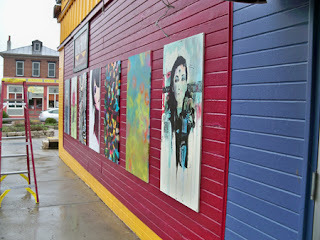 He stated here, " took some Street Art pictures I could find on Google. I assume Street Artists will not sue me…hopefully. If yes, you can find my contact details here." Can you PAY me please or this another case of just take images and screw you, then deal with my lawyer. I have contacted the lawyer and have had no response yet. All artwork/photographs published and unpublished are copyright to the owners of the work.They are NOT free simply by virtue of being on the internet. Just because there is not a © on the image does not mean it is not copyrighted. For more information of copyright Facts and Misconceptions visit here. Obviously the user does not know your name/the artist's name. I am puzzled why you have not contacted him/them and asked them to credit you and pay you? I have contacted them as soon as I discovered my image had been used. I have not received any response yet.